In February, Japanese Prime Minister Shinzo Abe  called on the National Diet to amend Article 9 of the country’s constitution, which renounces war as a means of settling disputes. Drafted by the United States after World War II, the constitution contains ‘some parts [that] do not fit into the current period,’ Abe said. He is particularly concerned with the constitutional provision that prohibits Japan from maintaining ‘land, sea, and air forces,’ arguing that it seems to be in direct contradiction with the existence of the country’s Self-Defense Forces. At a glance, Abe’s proposal seems deeply unpopular. According to one poll, some 50.3% of the Japanese public objects to amending Article 9. Only 37.5% of those polled favor such action. 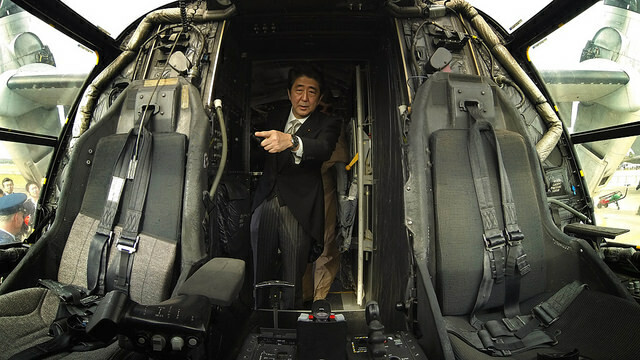 The good news for Abe, however, is that opposition to his efforts, though broad, does not seem to run deep. Voters, it seems, are less concerned about the direction Abe is taking the country than they are about his decision to make the issue a top priority. Revising the constitution would provide stronger legal grounding for Abe’s controversial defense measures. Introduced last year, the new legislative provisions lift restrictions on deploying Japanese forces overseas and expand the definition of self-defense to include aiding an ally. These, too, are unpopular – at least superficially. Some 51% of Japanese voters disapprove of the measures, compared to 30% who support them. And yet only 38% say  they would like to see Abe reverse course and repeal the legislation. To be sure, many in Japan are concerned about the implications of Abe’s agenda, feeling that it runs counter to the country’s national security and proper international stance. They worry that Abe’s defense moves will make it more likely that Japan will be dragged into war, putting an end to its post-war pacifism. Not all of the opposition to Abe’s agenda, however, stems from substantive objections. In some cases, concern focuses on the legitimacy of the process that produced the laws. According to one poll, 67% of respondents disapprove of how the ruling coalition pushed the legislation through the Diet. There is a widespread feeling in Japan that Abe’s cabinet ‘did not make a sufficient effort’ to explain the legislation to the public. By ignoring criticism from the majority of voters, Abe’s government allegedly discredited Japan’s democratic system. Similarly, some 51% of respondents disapproved of the laws on constitutional grounds, believing them to be in violation of Article 9 of the constitution, the provision that Abe would like to alter. These voters are less likely to support scrapping the bills; indeed, some of them may be mollified if Abe is successful in amending the constitution. There is also a simple, practical answer that explains why opponents of the laws may not be in favor of efforts to repeal them. Many in Japan would like to avoid a divisive debate that could distract the government’s attention from other priorities. Japan’s economy shrunk  more than expected in the final quarter of 2015, and its stock market has been in turmoil since the beginning of this year. No matter how unenthusiastic the Japanese might be about Abe’s security bills and his attempts to change the constitution, they would prefer that the issue be relegated to a back burner. That way, the government can focus on what voters really care about: turning the economy around and saving the country’s social security programs. Emily S. Chen is a fellow at the Hoover Institution, a Young Leader at the Pacific Forum Center for Strategic and International Studies, and a non-resident fellow at the Center for the National Interest. This article is presented in partnership with Project Syndicate © 2016.